India Outside My Window: Do you speak Indlish? This is with reference to our telephonic talks. I am awaiting the details of the programme as understood by me during conversation. Please do the needful and oblige. This is a true masterpiece of Indlish! 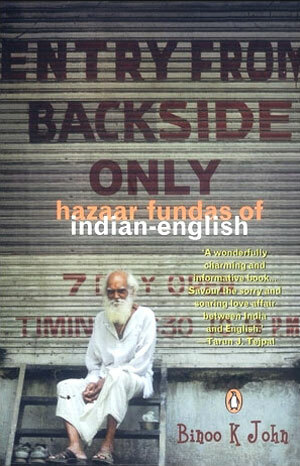 The English spoken in India has its own particular charm and flavour and is peppered with local colloquialisms and idioms, old-fashioned figures of speech, as well as some innovations of its own. Communication can be confusing in a country where cakes are called pastries, a dress is clothing, people ask you to off the light and on the fan, backside is not your rear end but the rear of a building, and people don’t die, they expire (like a gym membership or credit card). People also shift and not move house. And just to make things more confusing for foreigners, a cover is a bag or envelope, vessels are not ships but dishes, a hotel is actually a restaurant and a parcel is not a package to be sent by post but a take-away. Come to India, and you’re likely to be asked what your ‘good name’ is. Someone may tell you that their head is ‘paining’ or that they have ‘loose motions’ (diarrhea). Be sure to ‘click some snaps’ and don’t forget to let others know that you’ll be ‘out of station’. You’ll also see many signs for ‘suiting and shirting’ and ‘boarding and lodging’. You’ll also notice that the cost of a cup of tea is ‘very less’. Then there are the differences in pronunciation which can make communication a challenge. I’ve lost count of how many times I’ve been asked by waiters at the end of a meal if I wanted to order a desert. Then there was the time I was looking for 4th Cross (the streets in Bangalore are classified by a myriad of ‘mains’ and ‘crosses’. “1st Cross is there Madam!” is the reply I got. “No, not 1st Cross, 4th Cross,” I repeated. “First or Fort? You are confusing me Madam!” The tendency to pronounce ‘th’ as a hard ‘t’ sound common in many Indian languages also transforms third into ‘turd’, thin into ‘tin’ and thanks into ‘tanks’. And if things were not confusing enough, in South India ‘years’ are ears, ‘yearrings’ are earrings, and USA is pronounced You Yes Yay. Indians also have a deep love for acronyms. They’ll tell you about the VVIP who spent a week in ICU with high BP and a persistent UTI. Or they’ll complain that the OTG broke down but luckily they had an AMC. A student might say that after his MSC he wants to work for a BPO or MNC. And if you want to phone home, don’t worry, there are PCOs everywhere where you can make ISD and STD calls. On restaurant menus, you’ll often find creative spellings. I found some brilliant examples as I was having lunch today in a small ‘hotel’. The ‘desert’ menu proposed a variety of ice cream flavours, including: veneela, chock light, butter swatch and block current! Indian English can be a bit confusing (and at times amusing) for the outsider, but the colloquialisms, idioms, old-fashioned usages and innovations of the language are part of the charm of India and what makes India, well, India. "Ladies bottoms-only Rs.25 per pair"
Try this experiment.Next time you want to ask for 1st cross. Say"where is FUST cross?" and you will be given perfect directions. Oh I remembered one more. When they are getting married,they say"my marriage is fixed." What about 'exactly and approximately'? As in "the train leaves at exactly and approximately 3:00, Madam.". I remember one place had "burgarazzas" - I think those were burgers. My brother and I (who were raise in India)laughed so hard we cried. Not to mention cutely creative abbreviations, like "calci" (CAL-SEE) for calculator, "senti" for sentimental, and "apti" for aptitude test. I am not an NRI. most of the phrases mentioned above are quite common in India. please tell what should be the equivalent correct usages. then these post will become most useful. thanks in advance. you know number of English speaking people in India is bigger than the population of Britain. knowledge of English language gives us an edge in this era of globalization. Btw, I am from India. Thanks for the lovely posts on this blog.